Understanding what a space should be, should become, how it enables the desired experiences of those who use such spaces now and into the future is the fundamental responsibility of those who plan, use, and assess spaces and places for learning—all stakeholders in the institutional future. This understanding of how spaces matter to the experience of learners and learning builds on a foundation of a shared vision among stakeholders of what learners are to become and of the experiences that enable that becoming. Exploring and realizing such a vision is a complex, iterative process. Participants in this roundtable began by sharing what they had learned from years of experience—as design professionals and as academics from various spheres of responsibility—in planning, shaping, and assessing classrooms in the undergraduate setting. 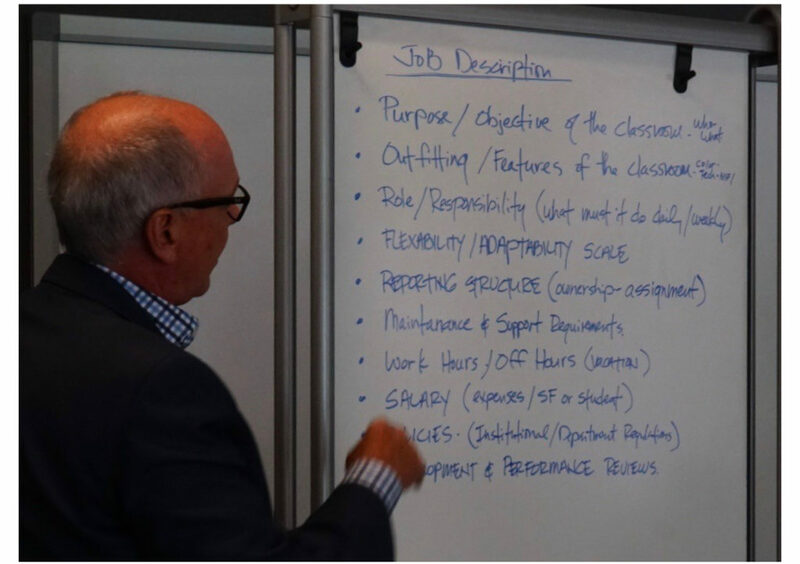 From their conversation emerged a set of principles about the “ideal” classroom, they then extrapolated those principles into a job description for the 21st century classroom for 21st century learners. Examined carefully, the various descriptors of what a classroom should do, as articulated by participants in this roundtable, can be translated into an assessment template, a means by which to determine if the classroom “works” as planners intended, if it serves learners and distinction in the near and far future.